So today I put Gorgeous Man on a plane for the USA. He will be gone for a fortnight a week in the USA roughly and then a week in Toronto, Canada. I even managed the drive home on the very scary freeway in a new car OK. There was one heart stopping moment, but we survived safely. Have I mentioned I hate driving on the N2 out of Cape Town? I know it seems like we are real jetsetters, but it’s just coincidence the way things worked out, we don’t usually fly all over the world for work. Um, apparently I can’t knit a beanie, and care for a one year old, and work a ‘proper job’ in under 12 hours – who knew?! It’s going to be a pictureless fortnight of posts since Gorgeous Man has taken my digital camera with him. Gorgeous Girl spent much of the afternoon wandering the house looking for Dahdi. I think somehow, that she is going to miss him much more than she missed me. Dahdi is the only word that we are sure she knows the meaning of! She’s got a few others, but they seem to be hit and miss, so I’m not counting them yet. Our break-away (from the guild) sewing group is having its first meeting on Thursday. We are meeting in a local park, which will be very nice, Gorgeous Girl will be able to run around without me worrying about her breaking anything (I’ll just have to make sure she doesn’t get too close to the resident tortoises). I’ll be taking knitting, since I don’t have any handwork at the moment. I’ve decided to machine stitch the applique down with matching thread. If I get a chance I’ll be visiting the thread store tomorrow, otherwise it’ll have to be Thursday. New Elna store in the mall was a disappointment. mostly nasty overpriced acrylic yarn, and polyester sewing thread, and the ladies were unfriendly and unhelpful. I’ll keep supporting the smaller local shops thank you very much. I seem to be down to once a week posts at the moment. Sigh. I’ve been knitting, but no pictures. I’m on the computer without the photo editing software. I’ve nearly finished a crossover knitted dress for Gorgeous Girl. Speaking of Gorgeous Girl, guess who finally has the first hint of a tooth poking through her gums? It only took a little over 12 months to come through. It’s my turn to do the single parent thing for the next fortnight. Jeff is headed off to Chicago and then Toronto for meetings on Tuesday. He’s attending a meeting in Chicago and then presenting a paper at a conference in Toronto. An Elna shop has opened up in the local mall. I was tempted to go and check it out. But a certain Gorgeous Girl was tired and cranky. 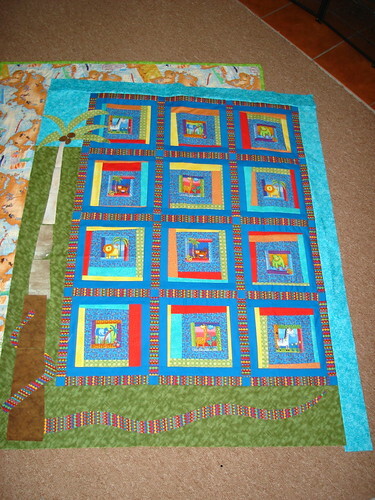 I’ll go next week and see if they have thread which will match the applique on my quilt. I’ve decided to machine applique that down. Once that’s done it’ll be off to the local long arm quilter and then I’ll only have the binding left to do!! I’ve finally joined Ravelry, you’ll find me there under ruthsplace. Not much other news going on. I’m back in South Africa, and mostly recovered from a marathon flight home. In total it took 29 hours from the time I left the hotel in San Francisco to touch down on the tarmac at Cape Town airport. We had nearly 3 hours sitting on the runway in New York while they sorted out mechanical problems with the plane, then they added extra fuel so that we could fly faster and made up some ground, so it wasn’t completely terrible. Travelling for your job sounds much more exotic than it really is. In reality, you spend a lot of time in meetings and hotel rooms, and there’s not much time for sight seeing. 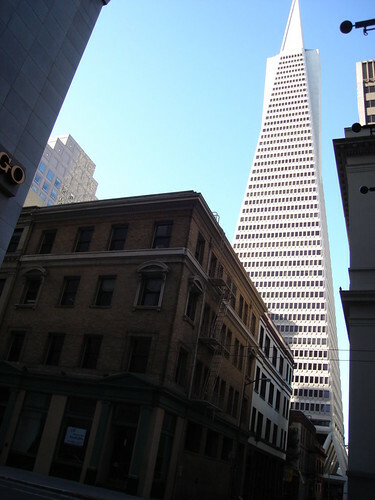 We stayed in the heart of the San Francisco financial district, not far from this very cool building. I really enjoyed walking to and from work each day. 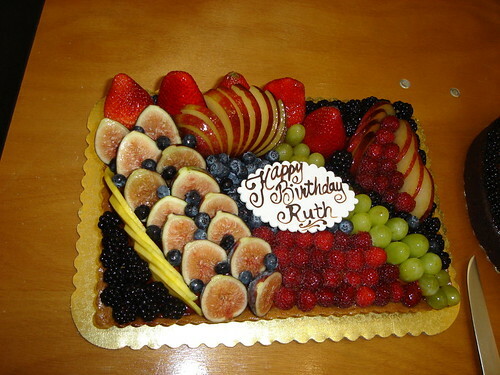 It was my birthday while I was in San Francisco, work provided this beautiful cake (actually I got to choose from a catalogue of cakes and picked it out). I did manage to make it to Vacaville outlets. One of my male colleagues has a very organised wife who sent him with a list of shops to visit along with a list of what he had to get. Since his daughter is only a year older than mine I followed him and scored some very cute clothes for a certain Gorgeous Girl. I also spotted a JoAnns. I had 30 minutes (it’s hard when shopping with others). This was the loot. 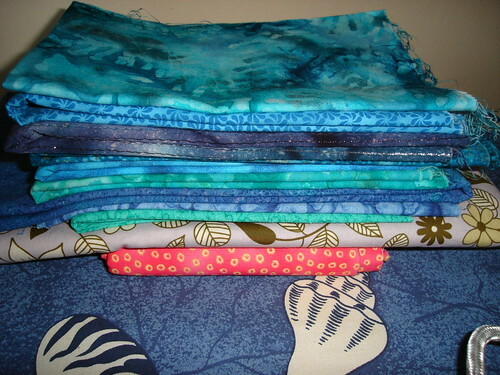 The blues are for my next quilt. The bottom two fabrics come from Britex Fabrics, from the remnant floor. The pink Michael Miller was a bargain, even with the exchange rate (which we will not discuss), the other one not so much, but I’m hoping there will be enough in it for a skirt for me. I left a baby behind and came back to a toddler. Gorgeous Girl took her first steps while I was gone – 4 steps on the lawn outside…she just thinks she’s so grown up now! 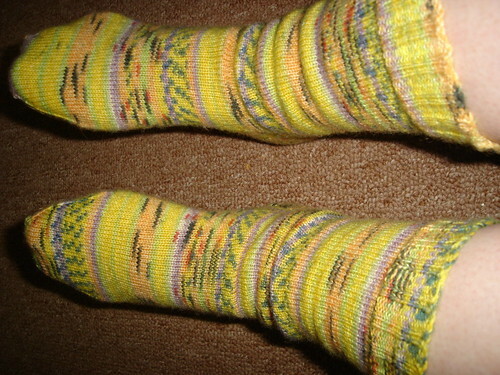 I ran out of time with my latest pair of socks before I left, so these got finished when I got home. I’ve decided it’s time to finish up some knitting UFOs – no I am not avoiding blanket stitching down the tree and the snake on the quilt because I can’t decide whether to do it by hand or machine… Seriously though, it’s a kids quilt, should I stich the fusible web applique down by hand or machine (keeping in mind my machine skills aren’t real great). I also can’t decide whether to try and match the thread to the fabric or go for the black country style look. Here’s a quick reminder of the quilt in question. Opinions welcome!! I’m quite stuck. Just a quick note to say hi. After 27 hours in transit we arrived in San Francisco this afternoon. The flight was uneventful, except for having my heal break off while running from security to boarding in New York. 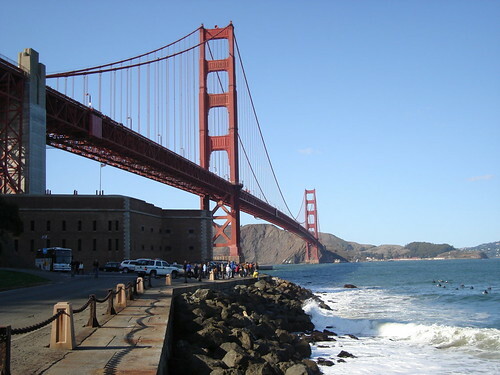 I threw the shoes away at the boarding gate and flew in bare feet to San Francisco. Surprisingly, I’m not terribly jetlagged. I put in a full day at the office today and feel fine. Not really much to share, since today was a workday. I did relish the fact that I was able to walk back to the hotel today after work, it’s an easy 20 minute walk. They have some sight-seeing and tourist stuff scheduled for later in the week, so there should be more interesting posts soon. Sarah asked about the blankets the Lesotho men were wearing. Lesotho is a mountainous country, and in winter it gets very cold so the men, and women wear blankets as part of their traditional dress. It has a practical purpose. Traditionally the blankets have been woven, but these days, many of them use modern factory produced blankets as well.